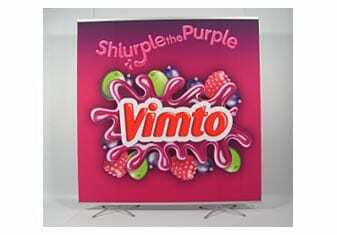 OK, so everyone in Sales and Marketing has experience of roller banners or magnetic pop up stands. Roller banners with the spring mechanism wound so tight that the banner leans forward and complete with curling graphics because of poor lamination. Pop up stands with panels to line up and a big chunky wheelie bin. One piece graphics – no joins. Easy to handle – not so easy to damage. Big displays possible with ease of portability and assembly. Here’s how it works. Let’s look at a banner size 2m wide or less. 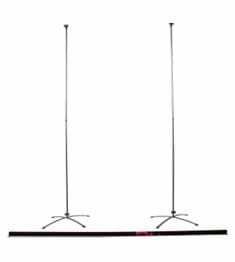 So, taking a normal backdrop sized 200cm wide or less – It is really simple. The rails are fitted to the top and bottom of the graphic and so you just roll the graphic up ready for next time. See image below. When the banner width exceeds 2m though, for reasons of practicality, the rails that hold the banner top and bottom must have the facility to fold down smaller. 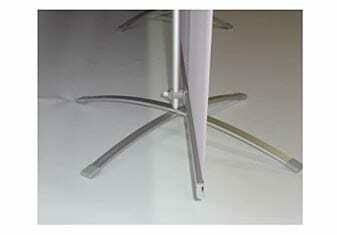 We use a flexible joint system that we call a wide screen joint. See image below, using short rails just to demonstrate the principle. So to one side of these rails, we apply self adhesive Hook & Loop which allows us to connect the fabric graphic fitted with the opposing Hook & Loop. So for a 3m wide banner, we would fold the banner in half to make it more portable at 1.5m. 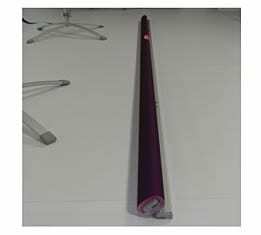 For a 4.5m wide banner, we would use 2 of these joints and fold the banner in a Z-shape and so maintaining a 1.5m rolled banner size which is easy to carry and transport. If it needs to fold away smaller, we can just use more flexible joints to accommodate that. 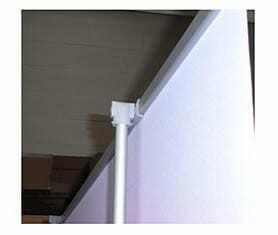 They also give the advantage of being able to bend to any angle whilst in use too – so you are not limited to having displays that may only be used straight. This is very advantageous when trying to make a display fit into different sizes of exhibition stand space.